See below the possible levels of donation to be part of our exclusive donor's circles: Friends Circle, Creative Circle or Artistic Director's Circle. "There are multiple reasons to why one would support an artist. The key aspect to Avatâra is that she's a human being who's adventurous, ambitious, creative, artistic, loyal, and focussed. I believe in Avatâra, have empathy for her objectives, and have enjoyed the productions that I have seen. One of her main drives is the need for more women to have a stronger space in the dance world. 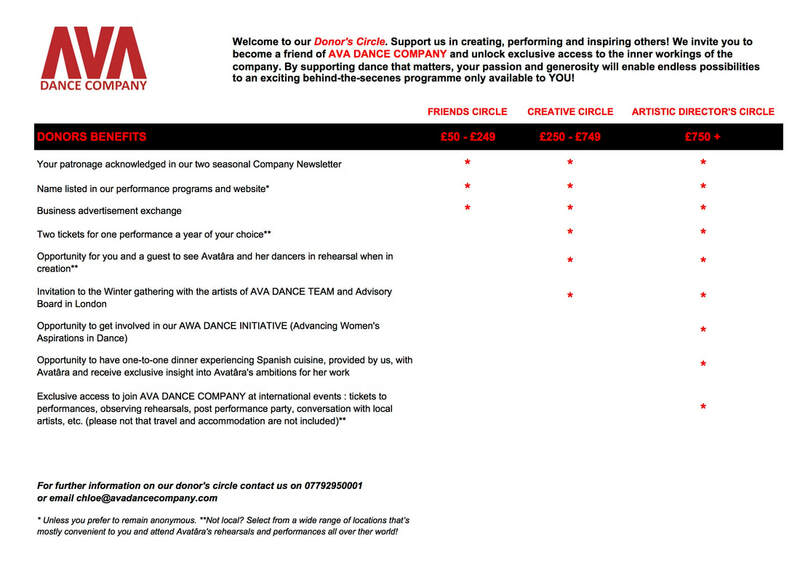 Whilst I have the ability, I want to do what little I can to help move the AVA DANCE COMPANY project forward"